Mann’s (2014) recent article in Area focuses on the curious phenomenon of ‘yarn-bombing’, explaining how its unusual nature renders it inherently geographical, unpicking the micro-politics at play. Yarn-bombing – also known as ‘yarn storming’, ’knit graffiti’, and ‘guerrilla knitting’ – merges street graffiti with knitting or crochet; knitted items, large and small, are added to the urban landscape in order to decorate it. Examples include scarves for trees, decorations added to lamp posts, and animals knitted onto benches. Emerging in America in 2005, this practice is both a form of political activism and a simple act of whimsical fun. 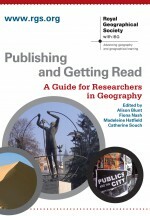 Whimsy is important to geographic research, Mann argues, yet occupies an uneasy position within the discipline due to its ambiguous nature. It is a woolly topic; difficult to represent, illogical, and unpredictable, three things seldom at the top of any academic’s wish list. Theorisations of whimsy generally come under the developing body of work called ‘ludic geographies’, which consider the everydayness of play. Whimsy, however, Mann suggests, can be considered ‘more-than-playful’, since it is highly political; it disrupts the everyday, often unintentionally, and alters the ways in which we experience and engage with the urban landscape. So how can knitting be a political statement? Mann gives three explanations; feminism, vandalism, and activism. Firstly, the practice of yarn-bombing brings knitting, a traditionally feminine activity, out of the home and into the masculinised urban spaces, giving them a ‘feminine’ touch. 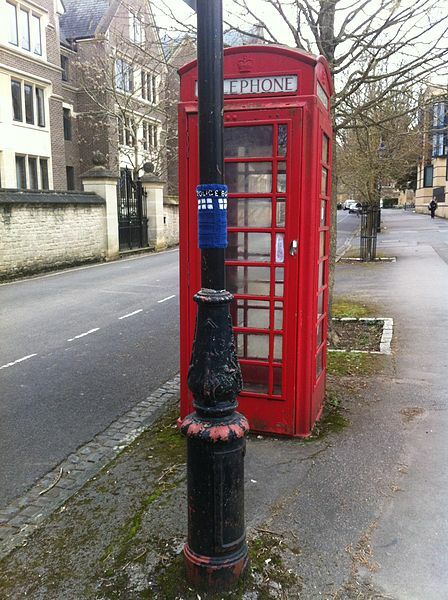 Secondly, as a form of vandalism, yarn-bombing provides a stark contrast to street graffiti. Finally, as a form of activism, it transforms and re-appropriates space in a gentle way, re-affirming the ways in which bodies can be re-formed and disciplined. In her own experiment in which she yarn-bombed Bristol, Mann explains that the ‘out-of-placeness’ of knitted items in urban spaces causes humour and surprise, as well as confusion and anger. It brings to the foreground aspects of the urban landscape that may have previously been overlooked or taken for granted as ‘ordinary’ and ‘mundane’. These interruptions to everyday life show how the world that we think we ‘know’ can be easily changed from its seemingly stable state into something unusually marvellous. Although you may not have noticed any woollen additions to your own surroundings, yarn-bombing has become relatively widespread across the UK. Reports of localised ‘yarn-storms’ from all corners of the country were rife during the festive period. In Essex over Christmas a group of knitters brightened up commuters’ journeys by topping post boxes near railway stations in South Essex with festive crocheted scenes (BBC News online, 2014). In a similar example, church volunteers brightened up Methodist churches across a very rainy Tynemouth in December, attaching 2,500 brightly-coloured woolly angels to surrounding railings (Chronicle Live online, 2014). 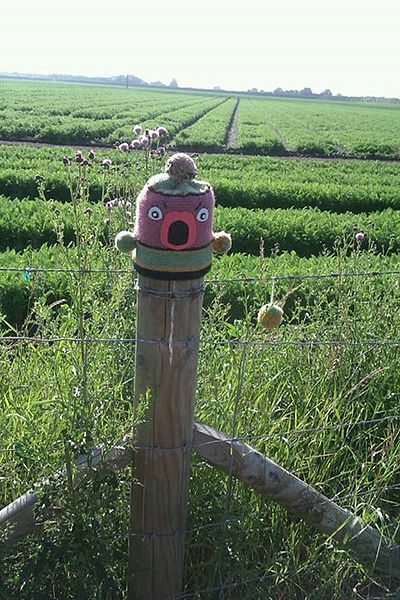 Both examples show how yarn-bombing can change people’s everyday experiences of urban spaces. The practice can also help bring together communities. For instance, knitters at a School in Melksham in Wiltshire decorated the tree in front of the Town Hall in order to bring the community together for Christmas (Wiltshire Times online, 2014), whilst residents in Bradley Stoke in Gloucestershire were encouraged to ‘adopt a lamp post’ and decorate them with knitted items for the festive period (Bradley Stoke Journal online, 2014). In a further example, a wool shop owner in Stockport used yarn-bombing this Christmas to raise money for a church food bank, hanging knitted decorations on trees overnight to be discovered the next day and taken in return for a donation to the food bank (Manchester Evening News, 2014). Thus, as in Mann’s article, the political potential of such woollen whimsy becomes clear. The fact that knitted scarves on trees have become subject of academic debate in geography shows the diversity and ubiquity of the discipline, but also its relevance to everyday life. 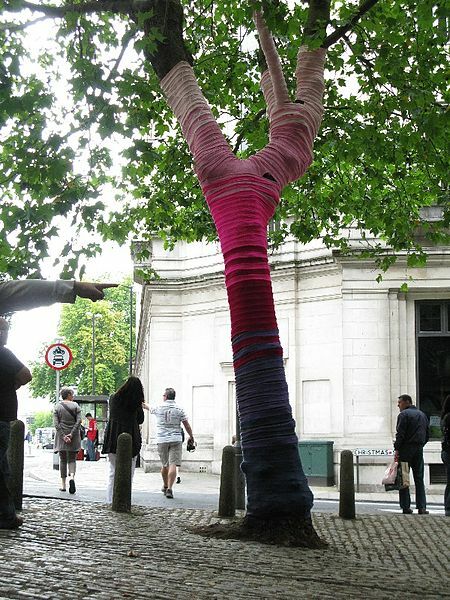 Needles-s to say, the phenomenon of yarn-bombing is one of the most peculiar examples! Mann, J. (2014). “Towards a politics of whimsy: yarn bombing the city”, Area, 2014, doi:10.1111/area.12164. This entry was posted in Area and tagged activism, ‘micro-politics’, Knitting, Ludic geographies, Vandalism, Whimsy, Yarn-bombing on January 12, 2015 by k8amongthepigeons.